An Intertops Casino player had an incredible lucky streak the other night when he won over $300,000 playing Let 'Em Ride poker and a slot game with a progressive jackpot. Donovan A., said he's going to buy a place in Las Vegas with his winnings. He said he enjoys slots and plays them a lot online and in the local casino, but he hardly ever plays poker or Let 'Em Ride. Winning so much at that game was just luck, not skill! “I’ve played it enough to know how it works, but it definitely was just a lucky win,” he told an Intertops Casino customer service rep. Player wins $120K on Let 'Em Ride poker game and another $180,000 on other progressive jackpots. 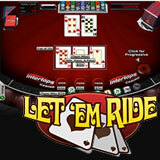 Let 'Em Ride is a simple game where players are paid based on their five-card hand. There is no dealer hand to compete with.